Earlier this year, we spoke to Sarah Williams - the newly appointed Regional Manager of the Sigmar Recruitment Galway office and recent nominee for the National Recruitment Federation ‘Recruiter of the Year’ award. Sarah commented on the gradual improvement in the Galway jobs market and the resulting expansion of the Sigmar Galway office. 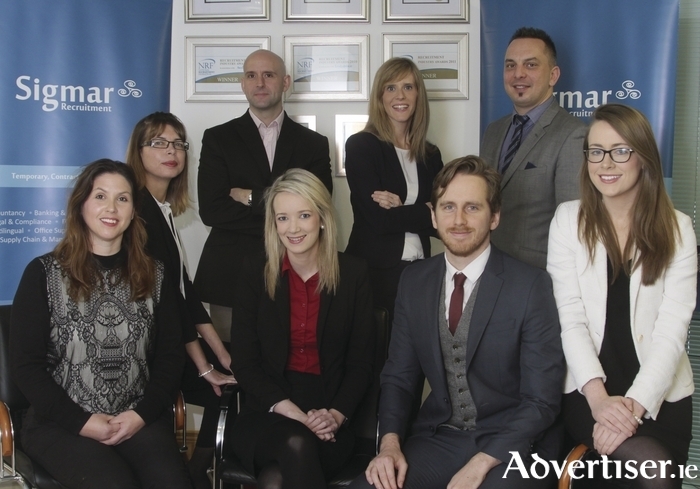 The company are delighted to announce that they have recently welcomed new recruiters to their team including Fiona McLoughlin (Engineering Recruitment ) and Cathy O’ Neill (IT/Software Recruitment ) with more vacancies opening up due to continued demand. According to Sarah, business is now thriving and it is only going to get busier. The Medical Device industry is booming. The ICT sector is strong. However, it must be noted that the Construction/Building Services sector is also on the up. Sigmar Galway has a dedicated team of consultants who focus on recruiting for this sector - sourcing, screening, interviewing and placing Design Engineers, Quantity Surveyors, Project Managers, Mechanical/Electrical Building Services Engineers, Civil/Structural Engineers and Technicians into roles nationwide. One of the biggest trends Sigmar has seen over the last six months is an increase in contract and temporary recruitment opportunities across all industry sectors. With a strongly funded, highly compliant operation and 14 years experience, Sigmar are supporting large temp and contractor projects right across Ireland. This year they are also delighted to have had their very own Elaine Murray nominated for Temp Recruiter of the Year at the National Recruitment Federation Awards. An extension of providing temporary staff is the delivery of Sigmar’s Outsourced Payroll solution. According to Louisa Poinboeuf, one of the Lead Temp/Contractor recruiters in Sigmar Galway, “Clients benefit from cost reduction, it frees up resources internally and allows them to plan, budget and control their payroll function more effectively. They value the fact that the service is confidential and secure and is paid on time every time”. Overall it’s been a busy 2015 in the Galway office and to show their appreciation to their clients Sigmar are holding a client event in the G hotel next month. “We’re looking forward to a relaxed and enjoyable evening with our clients thank them for their new and repeat business” says Sarah Williams, “we truly appreciate the trust these companies place in us to source the right staff and we hope to continue to do so for many years to come”. Page generated in 0.0728 seconds.